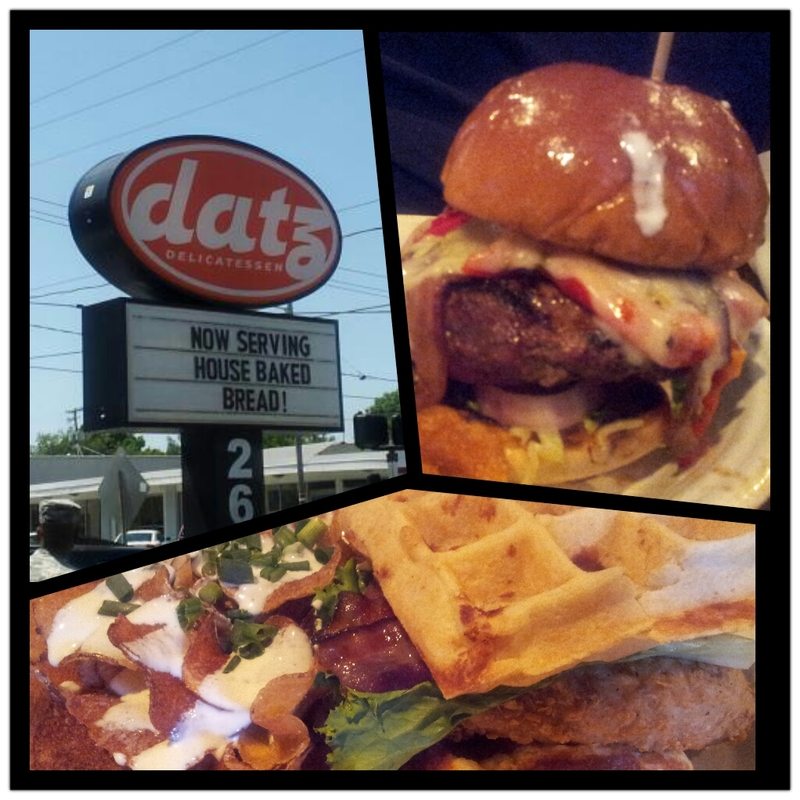 Datz, 2616 S MacDill Ave, Tampa, FL. I was anxious to stop at this gastropub after viewing their extensive online menu for breakfast, lunch, and dinner. So many interesting nibbles and bits that intrigued me, I knew I had to sashay my way over to Tampa and live it for myself. Let’s go lunch! They had just changed their menu for Spring, so I was a bit disappointed one of their star players, stuffed meatloaf sandwich, was not on the new menu for lunch. Oh well, they have enough other mad cray concoctions to put a smile on my face…now the problem is, which ones to try? Forever a gourmet hamburger lover, Datz’s “big a$$ burgers” had to come my way. Ten ounces of 100% ground chuck, cooked to order (rare please and thank you), topped with my choices of pepper jack cheese, roasted peppers, and applewood smoked bacon teamed up to be the magic combo. Triumphantly rare and perfectly seasoned, this big a$$ burger was happy dance worthy. 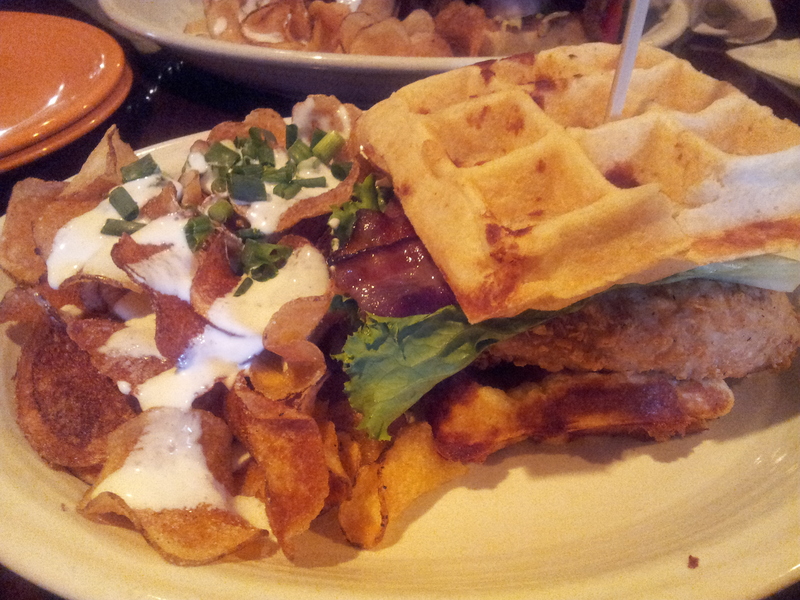 Next up, I couldn’t shy away from the chicken n’ waffles blt. I yearn for items I don’t make at home…nor have never tried before. Ding ding…order me up one on both accounts. Holy chicken, Batman….I am in love! Boneless fried chicken, bacon, lettuce and tomato, maple-jalapeno aioli, all gently tucked between two cheddar belgian waffles. No, I’m not freaking kidding. For real, this is a feast for the eyes and the tummy. Big luscious pieces of fried chicken with all the toppings were in total sweet and savory harmony… and the waffles. The waffles were sent from heaven. I have dreamt about this sandwich since devouring it. A definite “must-try” item for everyone, and on my top 10 list of Best Sandwiches Across America. By the way, both sandwiches were accompanied by Datz’s homemade sweet and salty potato chips that had an incredible blue cheese drizzle, topped with green onions. These chips can stand on their own. The drizzle sent them over the edge of jubilation. Crunch crunch ahhhhz. The interior of Datz is very cool, the staff is excellent (Elena rocks), a brewski lovers paradise, and a foodie lovers hot spot in Tampa. Datz’s bakery, Dough, located next door, opens in April. I poked my head in and this is not your average bakery/coffee spot. Let’s just say, red chandeliers float my boat, big time. I’m sure the menu will live up to the interior design. Beyond words! 5 out of 5 sweet and savory points of perfection. P.S. The stuffed meatloaf is available for dinner. Go for it! As seen on The Travel Channel’s, Food Paradise.